The last few weeks had been the low point of the trip, with a serious knee injury, food poisoning, and some not-so-welcoming towns. I was done exploring Villahermosa and wondered if the road ahead would be different. It should be all beaches and islands as I followed the coast to Campeche. Even the rain had stopped. I felt a new sense of hope and turned north. 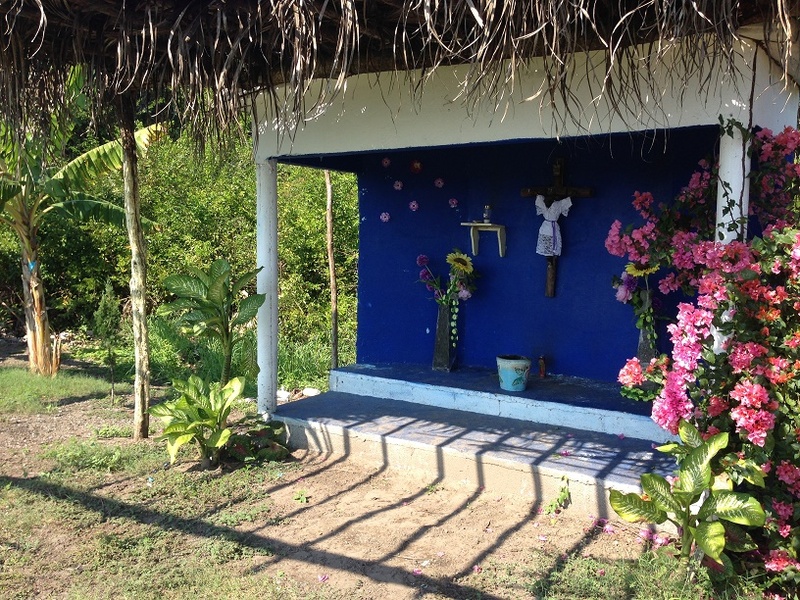 One of a kind roadside shrine. Photo by André. Early morning found me in the parking lot of Choco’s Hotel, still covered in puddles. I frowned. Despite my thorough cleaning of the Giant’s gears and chains, he wouldn’t shift right. I had 50 miles ahead, and was eager to get moving, but it was six days to Campeche. If the derailleur (gear shifter) needed replacing, this was the time to do it. But first things first. I ate breakfast at the hotel, emptied my room and loaded everything on the bike. Google showed only two bike shops in town, one of them a mere four blocks away. Off I went. Four minutes and a few pesos later I had a shorter chain and gears that shifted perfectly. As he worked he made small talk about famous racing cyclists, none of whom I recognized. (I even missed Lance Armstrong, though that was due to his accent.) My lack of racing trivia made him skeptical that I would reach South America. Back on the streets I wove through heavy traffic, counting off the blocks so I’d know when to turn. A white-skinned guy with filthy blond hair spotted me and gave out a massive victory roar. I held my fist up and soared on. It’s weird, but he really picked me up. I guess it was just nice to know that someone else in this corner of Mexico understood the drive for adventure. White people are messed up. The ride itself was a dream. 50 miles and no knee pain to speak of, plus the surroundings were sublime. Lush savanna gave way to coastal marshes, dotted with pockets of tropical forest. It was so green and the air smelled so fresh that I pulled over just to bask in it. The day was sunny and very warm, but I carried plenty of water. Today’s destination was Frontera, a coastal town near the Tabasco/Campeche state line (frontera means “border” in Spanish). It’s situated at the mouth of a river, and I crossed the water on a high bridge just before sunset, again awed by the beauty of nature. It was still light when I rolled into town and I picked out the least shabby of three hotels. There was no way to bring the Giant up the steep, narrow staircase to the hotel, but the owner promised me they had parking “just around the corner.” She grabbed the key and offered to show me the way. Around the corner meant go two blocks, hang a left, and go another block. She unlocked a door big enough to admit a Caterpillar; beyond was a walled yard that could have easily housed an outdoor Wal-Mart. A few parking spots to one side had a roof, so I chained the Giant up there and made sure I had everything I needed. Clearly I wasn’t coming back till morning. I followed the sound of music to a small pizza/burger place on the square (also on the second story—is this a thing?). I enjoyed a “Texas Burger,” which has all the fixings that we’d call a “South of the Border” burger in the States, and some deep-fried mozzarella sticks, a sight that brought tears to my eyes. I got back to the hotel room early and put myself to bed. 51.1 miles. Breakfast in Frontera. I’m hooked on motuleños. It turns out Frontera is an oil town, and morning brought a surge of oil workers in bright orange uniforms, probably finishing up some shore leave and getting ready to go back to a platform. Travel hint: if all the oil workers in town go to the same cafe for breakfast, try that cafe. The road out of was beautiful again, though hotter and more miles than yesterday. I crossed the state border in late morning and discovered a one of a kind roadside shrine on a strip of highway flanked by marsh. Sometimes I would hear a horrendous sloshing in the marsh, and discovered that cattle ranching is just as big on the coast as it is in the desert—you just let the cattle waddle through the swamp to graze. Once, even a horse came splashing through the foliage. The main street had no eateries but I discovered Gisela’s, an open air kiosk in a park. It’s the kind of place with no menu, just one plate of the day. Gisela apologized because today’s was chicken with a spicy sauce, and she was surprised when I excitedly ordered it. The real treat was fresh “agua de piña” (ice cold pineapple juice). I drank a liter. After lunch I asked Gisela if she had a bathroom. I started in disbelief and she repeated the directions. I’m pretty sure the fruit stand lady had to repeat them as well. From the smell inside the collapsed warehouse, that’s as far as most hombres get, but I followed the treasure map and eventually did my business in a real porcelain toilet (sans flush). 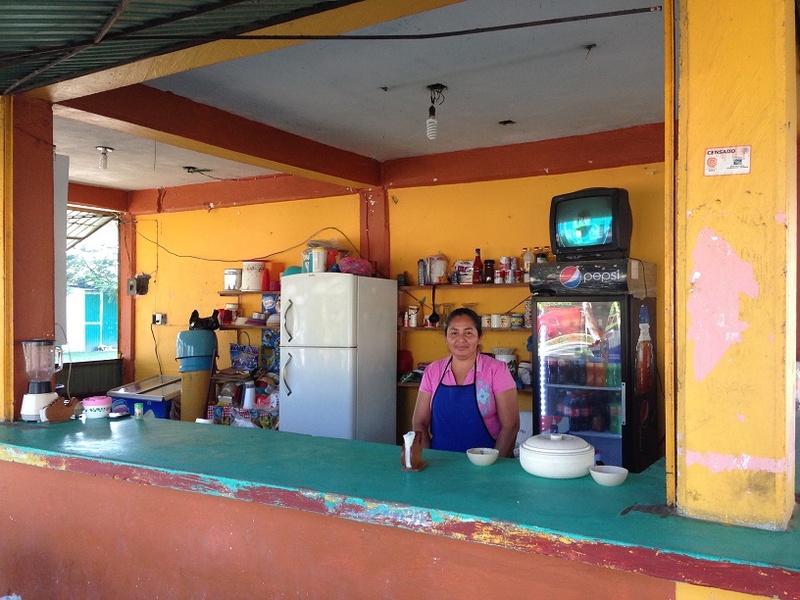 Gisela at her kiosk in Nuevo Progreso, Campeche. Photo by Andre. Late afternoon brought cooler temperatures and I whisked on at high speed—much faster than the cars and buses, which were backed up in a traffic jam stretching for miles. This seemed odd out in the country, but eventually I found the cause. A rally was happening at the small town of Atasta, and had fully blocked the road. I try to steer clear of political events in foreign countries. Rather than crossing the picket line I dismounted and walked around the edge of the crowd. When I was nearly to the other side, I finally caught someone’s attention. The cry spread. Several hundred protesting Mexicans turned their eyes on me. I did what any savvy traveler would do: I put on a giant friendly grin. I struck a pose, raising a fist in victory salute to the patriotic cry. Everyone in the crowd laughed and I got out of there. After that the roads were clear. It was forest on both sides with a sparkling lake just past the forest. The pine trees and lake reminded me of Michigan. It was basically dusk when I reached the shore of the Gulf, the first time I’d seen it in weeks. Out in the water were the twinkling lights of Ciudad del Carmen, a city on an island. A long bridge stretches from mainland to city, and I crossed that bridge in the dark, pausing to hear the gentle lapping waters and thinking of my night landing by kayak. In town I had set my rights on a hotel that looked good online. I rolled the bicycle into the lobby and approached a painted young lady behind the counter (protected by elegant iron bars). I asked to see a room. “I can’t show you one,” she said. I very carefully chose some Spanish words about how she looked, but bit them back. Instead I politely told her that I would look for another hotel. I then stretched out on one of the upholstered lobby chairs and pulled out my iphone, going through Google reviews and checking the location of each one on my map. She was visibly uncomfortable that I was there. I took my time. Eventually I did find a better place, with much friendlier lobby staff. Ciudad del Carmen is a real city, if a small one, and has a beautiful centro. The thing about island cities is that they’re never spawled out, and are almost always better for it. I spent the evening exploring and had a burger at a local pub. 62.5 miles. Total traveled this leg: 113.6 miles. Total traveled since Day 1: 4391.1 miles. Next time it’s iguanas, beaches, and the sweetest little stretch of road of the whole trip. Until then check out my past road logs or become a supporter. → Is There Anything Besides Nescafe in Mexico? While this story has little to do with your adventures above, your choice of a smile as a means by which to defuse a tense situation reminded me of a video game from 20 years ago. In it, the protagonist would eventually find his way into a jungle and encounter a band of hunters from a local tribe who were somewhat guarded and hostile as a result of one’s interloping. The only way to avoid them taking you captive in the game was a simple, one word command: smile. Any other attempt to do anything else, and they jumped you and dragged you back to their village. There were ways out of your captivity, but if you smiled at them first, they became less hostile and you could work your way past them. I always wondered which of the game developers had added that line of code. It was a good one! That’s incredible Dash. Which game was this? I was sadly late to actual computer games (preferring my Nintendo) but might check it out. Just curious, how did you discover the “smile” text command? Thank you Lloyd, and I’m enjoying having you here. Welcome to Rogue Priest. You had me chuckling in the food court reading this one, Drew! Viva Mexico! Listening to Rush’s “Fly by Night” as I was reading. Worked great. I also have to add a Viva Mexico. Teehee. Hahaha. Thanks Calluna. And I’m trying to remember how that song goes now…. I might have to google it.